As I already mentioned on the page about my own gear, I really like Belgian rockband Triggerfinger and especially their frontman, singer/guitarist Ruben Block. He is kind of known in Belgium for being a gearhead as he changes equipment quite frequently. Ruben usually builds his sound using a wide variety of amps, including Matchless Spitfire and Fender Bassman combo’s and Hiwatt Custom 50, Fender Bassman and Marshall Plexi heads with Marshall and Belgian custom made FAD (Freeqi Audio Design) cabinets. These amps are mostly set up very clean. Using a switch on his pedalboard, he plays rhythm parts through one amp and he then adds the second for choruses and solo's. Ruben is always positioned stage right, next to drummer Mario Goossens’s kit, with his amps in a V kind of set up. Ruben’s favourite guitar is a cherry red 1964 Gretsch 6120 Anniversary hollowbody. On the back of this guitar are the autographs of some of his favourite guitar players: master of the rumble Link Wray, ZZ Top’s Billy F. Gibbons and The Cramps’ Poisin Ivy. The Gretsch has a Hilotron 'filler' pick up in the neck position and a Filtertron in the bridge position, which is used exclusively. Ruben once said about his Gibson "I haven't seen a guitar yet that obeys me as well as this beast does. I can even control it's feedback perfectly. I just know which sound is gonna come out of it. As if it were an extension of myself." Ruben also plays Fender Telecaster (the Danny Gatton signature series) and Gibson (his really cool 1954 ES-295 and recently a Melody Maker in CGCFAD tuning - which is dropped D tuning one full tone down) guitars. He had a custom guitar designed by Hilko Nackaerts for the fall tour of 2011 with Within Temptation. After the Trigger for life benefit show, the Hilko LD, with serial number 001, was sold online for an astonishing 7900 euro's. 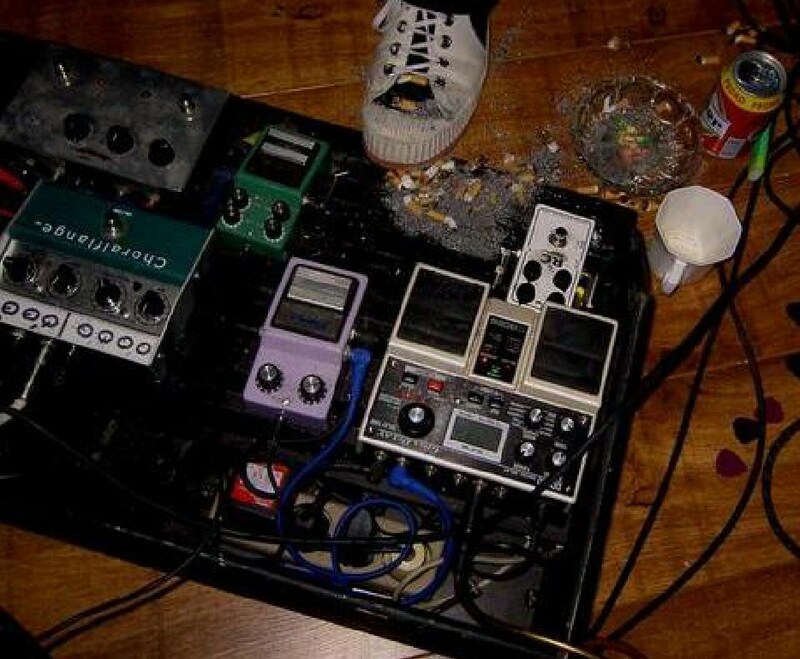 I found some pictures online of Ruben's pedalboard and thought you might be interested. Click on the images to see them full-sized. 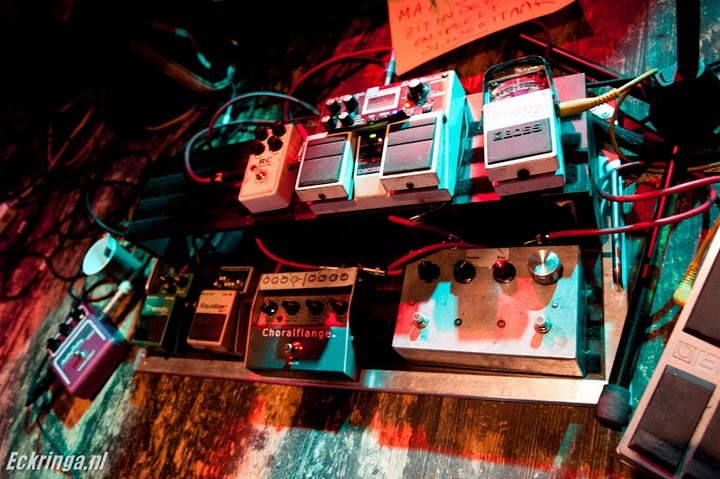 This picture is from 2008 and shows a rather messy pedalboard. Since I’m not sure how Ruben’s effects chain runs here, I’ll just briefly describe each pedal. The grey pedal in the top left corner is in fact a double one, consisting of two fuzz clones. Ruben had it custom built by a friend and uses it to make his signal really dirty. Next to it is an Ibanez TS9DX Turbo Tube Screamer, one of the latest incarnations of the famous TS9. The white pedal on the top right is a Xotic RC Booster. On the bottom row, we can spot the popular Fulltone Choralflange, which is Mike Fuller’s chorus and flanger in one package, and another Ibanez, the classic CS9 Stereo Chorus. Finally, the big box in the bottom right corner is a Boss DD20 Giga Delay. “In fact you’ve got four presets and one manual program, which makes for five different kinds of delays, different lenghts, very easy to switch, because you see, I sing, I play the guitar so I don’t have much time to take care of the finetunings. Now I know that this is my short delay and the other is my long one, which is easy. In the studio I use a Roland Space Echo, the DD20, the Maxon AD-999, a big purple pedal with a delay up to one second.” I’m pretty confident the beer and cigarettes add some mojo to Ruben’s tone as well. In 2009, Ruben apparently cleaned up his board a bit. There’s another fuzz in front of the Colorsound Bee Baa (a Way Huge Swollen Pickle Jumbo Fuzz, loosely based on the Big Muff Pi), the Xotic is replaced by a Fulltone Fat Boost, three new Boss pedals pop up next (a GE-7 Equalizer, TR-2 Tremolo and TU-2 Chromatic Tuner), then there’s a Little Lehle Looper Switcher, which is probably used to switch between amps, and lastly the Giga Delay and Choralflange. This picture is from last year, 2010. It’s the same board as on the previous two pictures but the pedals have changed a little bit again. The Lehle Looper is now in the front row (probably because this allows some easier switching), followed by the Colorsound Bee Baa, the Fat Boost and the GE-7, TR-2 and TU-2. The Fulltone ‘69 is Fuller’s version of the Jimi Hendrix Fuzz Face and has taken the place of the Swollen Pickle. The Colorsound Bee Baa, the Giga Delay and the Choralflange are the only pedals which have lasted through all three incarnations. On those two last pictures, you can see a yellow jack laying across the board. This one runs from the tuner output of a Boss FV500L Foot Volume / Expression, which is kept of the board, to the input of the Boss TU-2. This way, when Ruben uses the volume pedal to mute, he can either tune or switch guitars silently. The red jack on these pictures is used to connect the pedalboard (the '69 fuzz) to the volume pedal, so when setting up, Ruben only has to worry about connecting his guitar to the volume pedal and the pedalboard (the Boss tuner) to the amps. Ruben has used a wah wah pedal in the studio but he doesn’t use one when playing live. 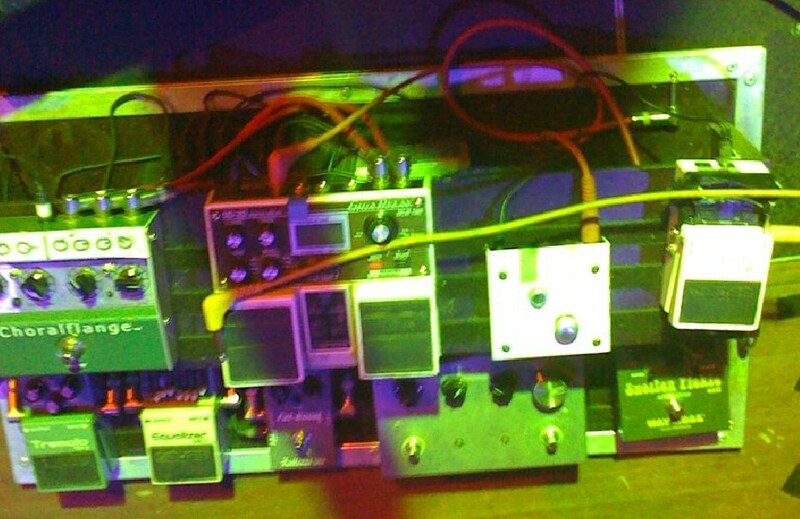 Below is an interesting picture of the back of Ruben's pedalboard, as we can follow the signal chain partly. The guitar cable goes to the Boss TU-3 (with the custom Nichiban sunray protection), the yellow patch cable leads from the tuner to the Boss volume pedal and from there a red patch cable goes into the '69 fuzz. Then the pedals in the front row have to be added in, probably in the order they're standing in: Colorsound Bee Baa, Fat Boost, GE-7, TR-2. Obviously the Choralflange is stereo connected to the Giga Delay, which is the last pedal in the chain. The strange thing is that the orange patch cable in the right output of the Giga Delay is going to the front row again - could this mean that the Colorsound Bee Baa is in fact the last pedal in the chain...? The picture below was taken in November 2010 during a workshop Ruben and Triggerfinger bass player Monsieur Pol gave about their gear. The Boss volume pedal is connected to the Boss tuner. Then there’s the Colorsound Bee Baa, the Choralflange and the Boss Equalizer, Tremolo and Giga Delay. Quite surprisingly, the RC Booster pops up again, this time almost at the end of the chain. The purple pedal on the left is the Maxon AD999 Analog Delay which Ruben spoke about before. While they were touring all across Europe during the 2011 summer, I had a chance to check out Belgium's finest rock band at the Ardentes festival in Liège. 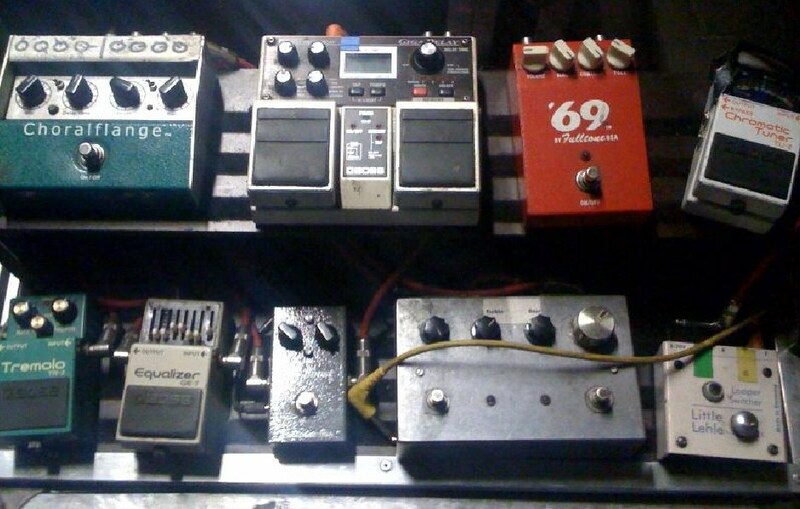 Ruben's pedalboard once again had gone through some changes. On the bottom row from right to left were the Colorsound Bee Baa, an FAD custom booster pedal (single switch, no potentio meters as far as I can remember), the Choralflange and the TR-2. The top row contained, again from right to left, the TU-2, the DD-20 and the Voodoo Vibe. He bought one Victoria 45W low power 2x12 Twin (labelled "LP Twin", positioned to the right of him) in the US to record All This Dancin' Around and one 80W high power 2x12 Twin (labelled "HP Twin", behind him) in Belgium for the extra boosts. In between both was a similarly looking FAD dummy cabinet, containing XLR outputs and power connectors. Triggerfinger were the houseband for De Laatste Week, a one week only talkshow on Belgium's national TV station VRT. With some of Belgium's best known artists, they played their biggest hits of the year. Ruben used an interesting selection of amps for these small TV live performances: a Fender Princeton (an at the time low budget 1x10 combo, used as the basis for the Mesa Boogie MK I), a vintage Magnatone (this normally stays in the practice room with the Princeton) and a boutique Matchless Spitfire. In March 2012, Triggerfinger played a Soundclash at the Lotto Arena in Antwerp against De Jeugd Van Tegenwoordig, a Dutch rap group. Needless to say, Triggerfinger won. What's more important however, is that Ruben's set up had changed a bit again. With the two Victoria tweed twins and the FAD cabinet still there, this time he also had two Hiwatt heads (one of which was not powered on) and a Vox Night Train head (a stylish budget single channel valve amp) on stage with him. Time for an update! Ruben Block was kind enough to take the guys of Musicmaker, a Dutch music magazine, on a tour through his set up in this YouTube video. The picture above is taken from that video. He explains a little bit about his guitars and practice amps versus gig amps before elaborating on his pedalboard. From his guitar, the signal goes to the volume pedal straight into the Boss tuner. He says he experiments a bit with pedal placement as well, which is why the Diamond TRM-1 Tremolo, an analog pedal with digital functions, is next in line. Then there's the old trusty Colorsound Bee Baa, followed by another new booster / overdrive, the Way Huge Angry Troll, quite naturally with the 'anger' button set to the maximum. Ruben uses the chorus mode the most on his Voodoo Vibe. The Choralflange is another stayer, which goes stereo out to the Giga Delay, on which he likes the use of the different banks. hartelijk bedankt Otto Stomp, for sending me some insightful new information!